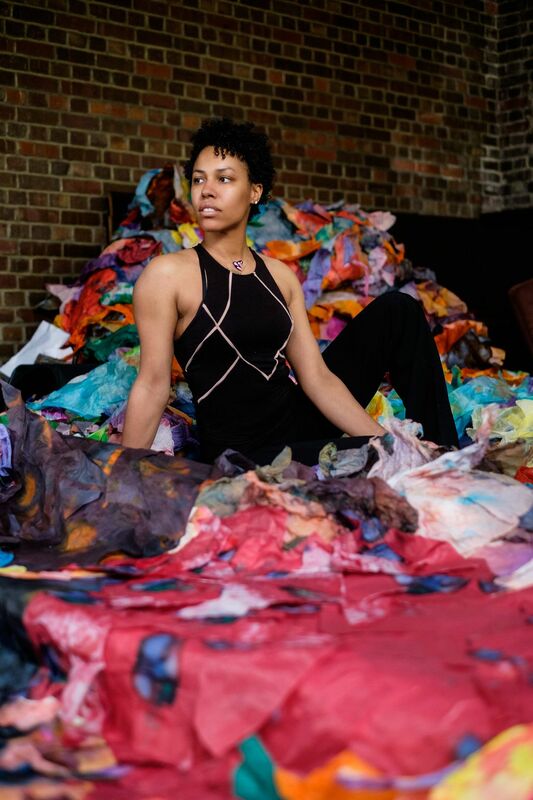 Freelon’s assemblages reside in collections around the world, from U.S. Embassies in Madagascar, Swaziland, and Rome, to the University of North Carolina, Chapel Hill and the Smithsonian National Museum of African American History and Culture. 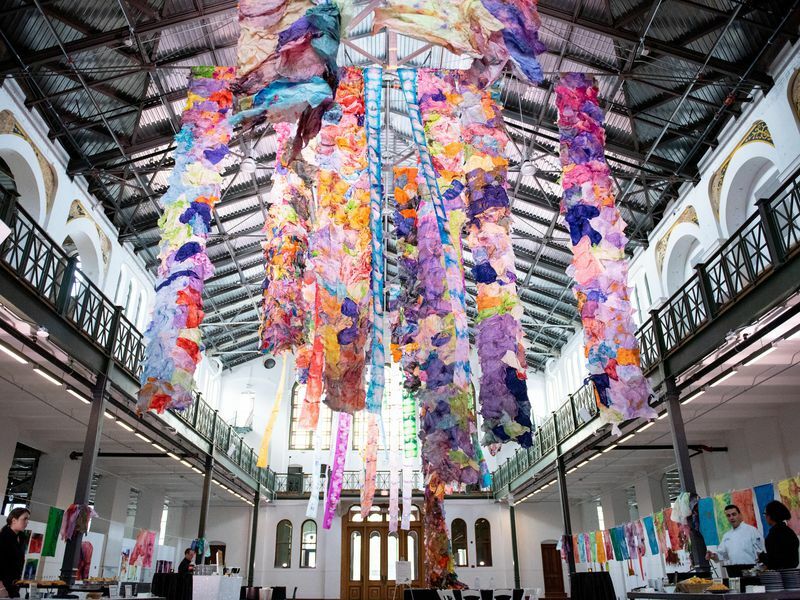 In June, she installed a monumental, interactive tissue paper sculpture for the first annual By The People International Festival, organized by Halcyon, at the Smithsonian’s Arts and Industries Building. Named “Reciprocity Respite & Repass,” her artwork was one of a selection of immersive and interactive art installations at the AIB, the headquarters for the festival. In this conversation with Smithsonian’s Second Opinion, Freelon discusses why art matters in the 21st century. For her, art lends individuals a way of contemplating life’s fragility and uniting through a shared sense of aesthetics. By making beautiful objects, she believes, visual artists have a unique opportunity to connect people, in ways that technology may not. When did you discover your medium, working with tissue paper and water? In 2006, I was in graduate school in Boston at the School of the Museum of Fine Arts, now part of Tufts Museum School. At the time, I lived with my grandmother and it was a found artist’s dream treasure trove because she did not throw anything away. Queen Mother Frances J. Pierce said, “We grew up a family of sharecroppers that never got their fair share.” She would always speak in rhymes and her sayings come up often as titles in my work, such as Bloom Where You’re Planted. She was very proud of her African heritage and really embraced it before it was cool. She followed the original Black Panthers. And she had stuff everywhere— books, papers, magazines stacked to the ceiling. She just collected and collected. There were journals and Confederate money I found, just things that had not seen the light of day in 50 or 60 years. Eight track tapes. Hot combs (the original kind that you put in the oven stove). Thousands of keys and pens. So one day, I went to the basement and discovered this tissue paper that was water damaged. It must have been a leaky pipe or something because it was right under the bathroom. There was a watermark from a constant drip, which had to be years ago, on this rainbow pack of colored tissue paper. What was so powerful about the visual manifestation of this leak for you? The watermark is a familiar sign to most people in the entire world. It just means: water was once here. You can see that in a lake that has receded. You can see it in the desert. You can see it in a rainforest, creek bed, even the Grand Canyon. It’s a marker of time or evaporation — a familiar sign to all human beings. I felt the commonality and a kind of interconnectedness of our humanity. This beautiful little accident sparked a world of discovery for me. And three weeks after I found the stained tissue paper, Hurricane Katrina wiped out the Gulf Coast. So, I’m finding a parallel between water moving color literally and water as destruction. Seeing the images in the media and simultaneously watching water push ink out of tissue paper, I was struck by how a constant drip of water can dilute pure color— and I reflected on the fragility of life. I also questioned the hierarchy of art materials. My grandmother used tissue paper in elementary school art classrooms, and there I was, discovering and using tissue paper for my graduate art class. Did the fragility of tissue paper require copious trial and error? When I first used the tissue paper I didn’t know what do with it. I tried to mimic the water mark and couldn’t. I was pouring carefully, using a watercolor brush, trying to get it right. But it didn’t work. It just looked like a mess. So then I got a water balloon, and put a pin in it, and let it slowly drop on the tissue paper, simulating a drip that might come from a leaky faucet. That’s when I realized, oh my gosh: it’s not a steady stream. It’s a drip process that pushes the ink to the outer edges. At that moment, I also thought about middle school. I always knew I was going to be an artist, and I remember looking up at the dropped ceiling and often there’s a brown water stain on the tile. In my boredom as a child, I remember thinking, what’s happening up there? I think about how brown paper in front of buildings that are getting renovated gets wet and leaves a stain. You see it also in dried up puddles. It’s just so beautiful to me. It reminds me of the macro and the microscopic. But aren’t there unique conservation challenges with such delicate material? When I started, I was feeling a little self-conscious about tissue paper. It’s fun to experiment in art school, but the point is you want to know how to make a living as an artist. You want your art to sell, and the ephemeral nature is part of my work. Creating an installation, a temporary sculpture, or even a performance is one thing. But a collector wants to know, how long is this going to last? Now I actually enjoy that part of my art, that feeling that makes folks a little wary and uncomfortable. Well, it is in a gallery so it must be worth something, right? But if tissue paper is on an elementary school floor of an art room, you just sweep it up and put it in the trash can. So my question as an artist is: What fuels our desire to preserve or protect something? You know, we buy flowers— beautiful bouquets for hundreds of dollars sometimes. They die. They’re dead actually and we enjoy that. It’s something that we invest in. We spend hundreds of dollars on a delicious night out of food. What we appreciate and why we appreciate something is interesting to me. Tell me about the work you presented at the By The People Festival ? The great thing about festival is that they specifically sought artists that have interactive components to their art. And what’s great about tissue paper is I can work with anyone from under 1 year old to over 100 years old. I use the most simple materials so anybody can interact and join in. I’ve done collaborative tissue quilt-making a few times, once at the North Carolina Museum of Art. You sit down next to somebody and you start looking at bits of torn tissue paper, which is interesting because of all the colorful stains. You pick your favorite color and you start connecting the papers with just a simple glue stick— Elmer’s. My materials are not a surprise or a secret. You’re sitting; you’re building, piece by piece. And as you get bigger, you bump into your neighbor on the right, your neighbor on the left, your neighbor at the table in front of you. You are joining and talking because the action is pretty simple, like a quilting bee. Your mind kind of shuts off and it’s almost like a form of mediation. Some people are very quiet and work very meticulously. Some people are sloppier and just talking. But once you get in the groove of things, you have permission for your mind to take off a while, doing this task that is repetitive. But it’s also about that unity, that togetherness, that strength and power of joining together as opposed to being one piece flying off by itself. How do you feel about being labeled a female or African-American artist (or both), rather than simply “an artist” as say, Picasso or Warhol is? First of all, I am like Picasso and Warhol. I have vision and a dream and an overwhelming desire to create. I love that question, mainly because my favorite thing to say to picky young artists is: Okay, you don’t want to identify as female? You don’t want identify as Black? Well, I’m going to apply to those grants, and I’ll take them. You don’t have to take them. Get in line for the generic ones. You don’t have to identify as anything. I know that there are historical inaccuracies and inadequacies. I know that it’s not fair and that other people are getting opportunities in this closed inner circle. But these grants for artists that are underprivileged, or underserved, or minorities— whatever you want to call it— this is an attempt to level the playing field; to offer opportunities to see new perspectives; to honor different cultures; to embrace that otherness. It doesn’t matter if you don’t say a thing. You will still have some sort of identity, and for me, I embrace the myriad of my otherness. Recently, I began to identify as a queer artist as well. One of my mentors is the contemporary painter Beverly McIver, who is a professor of art, art history and visual studies at Duke University. When I was 14, I used to sit in her studio and clean her paint brushes. She was the very first Black, female artist and professor that I met in person. I want to be that motivating source for someone else who has a dream and a passion. What role should artists take in times of political and cultural division? Artists are always at the forefront of revolution. They are the ones that push the buttons that make us stop and say, this isn’t right. They spark dialogue. We aren’t held back by, what will my town think? Am I going to get fired? Is this okay? Your job as an artist is to utilize your freedom to speak your mind and inspire. And at the same time, be ready for backlash, or the people that you are going to anger. For me, my place of peace is always back in the commonality of us all. We can all agree that this is a watermark, right? I dislike you and you dislike me, can we find some common ground? Can we agree that this piece of art is beautiful? Halcyon’s “By the People Festival” took place June 21 - 24, 2018, at five official sites and numerous satellite locations throughout Washington, D.C.